Do you ever look at your siblings and think, “How can we be related and still be so flippin’ different?” It’s not uncommon for members of the same family—even those who are closely genetically linked to each other—to display different characteristics, to adapt to the environment, and to appear in some ways, at least on the surface, to be distinct. Funny enough, the same is startlingly true with coffee, even simply within the species Arabica. There are hundreds of varieties with individual proper names planted all over the world, and many of them grow differently, look different, and certainly taste different from each other—but when you dig below the soil and research each plant’s roots, you’ll often find yourself tangled in a network of related, crossed, back-crossed, and derivative genetic lines that, well, often lead back to one or two or three main branches. 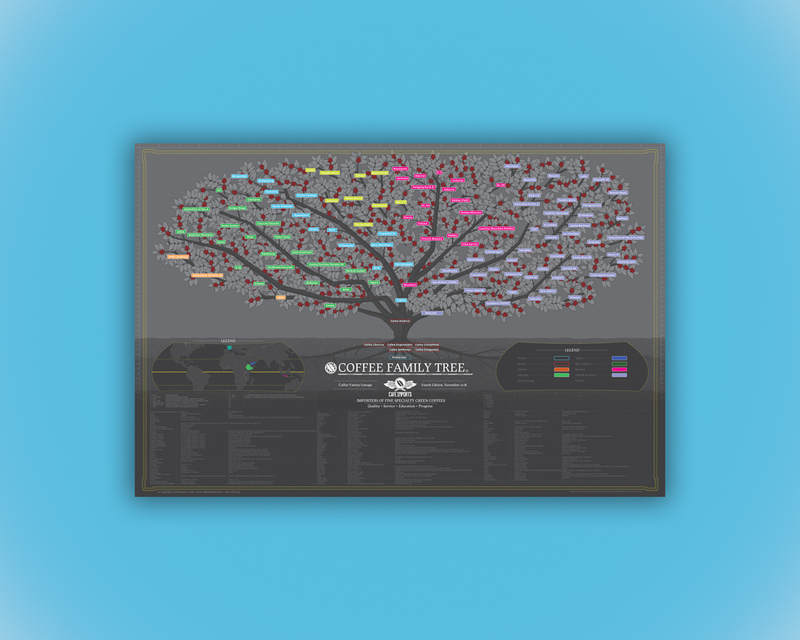 This is how the Cafe Imports Coffee Family Tree poster project began in the early 2010s, with a general curiosity about the varieties that coffee people were talking about and noticing, and wondering how they related to each other, broadly speaking. Printed posters of the first and second editions were distributed to countless roasters in the English-speaking coffee world, and by 2016 the posters were only slightly updated content- and design-wise, as well as translated into Arabic, Korean, Mandarin Chinese, and Russian. 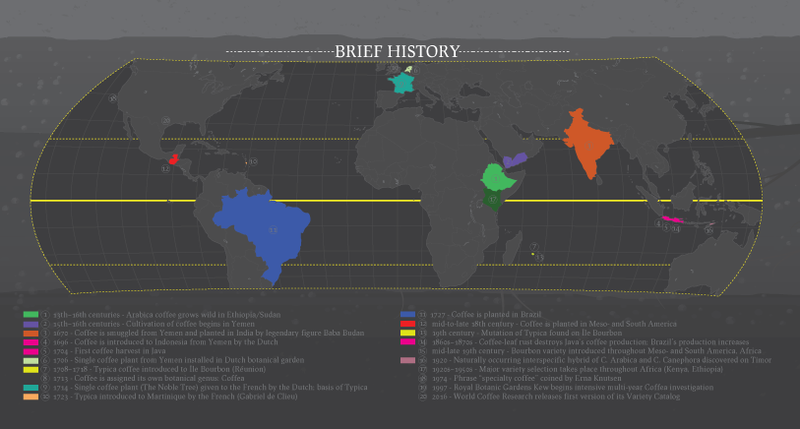 At Cafe Imports, we’re particularly interested in coffee varieties (and cultivars, and hybrids) for several reasons: One is that, well, we’re a pretty nerdy bunch, and we are very curious in general. We like to know how things work (or don’t work), and of course how to improve them. Another reason is that we work closely and directly with coffee farmers who might have one or several types of coffee on their land, and knowing more about the plants themselves can help us be a better partner to the producer through shared context and understanding. Third, like many other specialty-coffee companies, we are concerned about the effects of climate change on the coffee industry, and we have watched the intersection of monoculture and climate change with the most recent prevalence of coffee-leaf rust in Latin America, as well as drought affecting what were formerly considered so-called “drought resistant” coffees in East Africa. “One thing that shows up really really quick is just how small the pool is,” Ian says. “I mean, genetically we’re probably technically in a monoculture.” Ian should know: To update the tree, he cataloged and organized a couple years’ worth of research, cross-checking, and feverish spreadsheeting on an epic mission to not simply update the poster’s general data, but to make it a useful, practical, and eye-opening resource for other (nerdy) coffee people (like us). Over the course of his research, Ian kept an Excel document with every variety he encountered from a variety of sources, including Jean Nicolas Wintgen’s pivotal if dense book Coffee: Growing, Processing, Sustainable Production, and, once it was released online, the World Coffee Research Variety Catalog. “The process was really fun and simultaneously really frustrating,” he says. “The information backing where these varieties come from, the providence of a given coffee is really shaky a lot of times. Looking online, you are maybe looking at really once source repeated five times.” Ian, a natural researcher who says, “I don’t super care for anecdotal evidence,” began poring over every known resource related to coffee varieties, performing Google Scholar searches and cross- and double-cross-checking sources to confirm the information he found was as correct as could be expected. 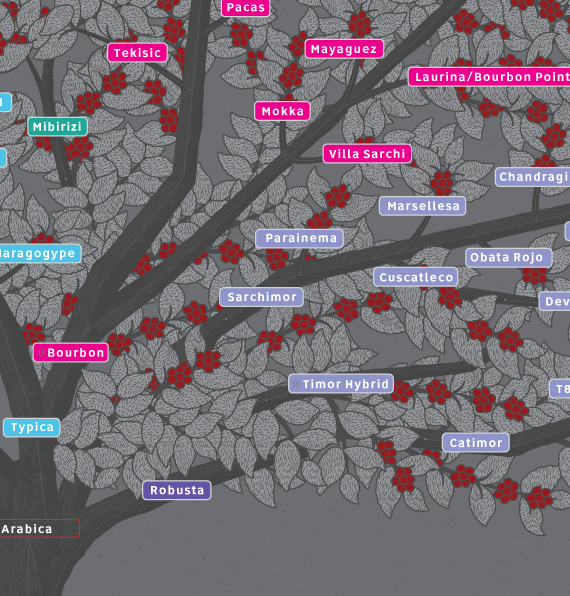 Once Ian had narrowed down not only the most significant varieties, cultivars, and hybrids he thought the updated tree should house—and even his “narrowed down” list contains more than 100 coffees—the tree itself needed to be laid out in a way that shed more light on the genetic links between types, and which could be used as a launching pad for deeper exploration into coffee botany. Enter Cafe Imports’ creative director (and resident cartographer) Andy Reiland, who used his experience with building the many complicated layers of the World Specialty-Coffee Maps to design a family tree that used specific colorways and directionals in order to tell more of a complete coffee story. Andy racked his brain for weeks, laying out and re-laying out the list of Ian’s researched coffees this way and that until he came up with a stylized version of the tree that could convey information while retaining the original tree shape and motif. “We figured out that if we stylized the tree with thick sections of leaves, we could use the leaves to cover branches and allow new branches to poke out from behind leaves where we needed to start new significant lineages from hybrids,” he explains. 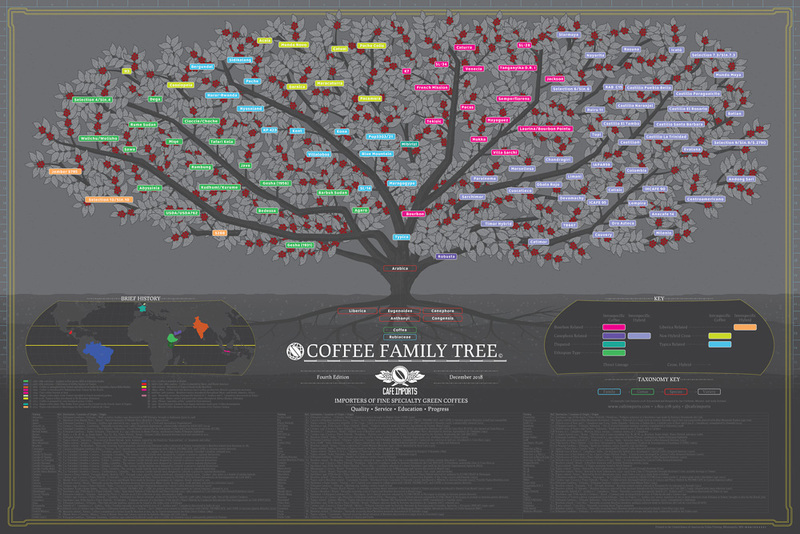 “To ensure that the poster could spell out more information rather than just look pretty, we introduced an information-dense table on the bottom that lists each variety on the tree along with its origin, derivation, and origin story.” The table is complete with a cross-reference code so that the curious coffee person looking on can easily identify the variety’s position on the tree. “The main objective was to have the poster be able to teach without having a teacher present,” he says. The Coffee Family Tree, like coffee itself, is intended to be a somewhat “live” resource, and will change and improve as Ian and Andy continue to research, learn, and think critically about the format and the information it contains. It still won’t be able to explain why your brother is so weird, but hopefully it will help provide some context for our nerdy coffee friends who want to obsess over genetics and botany.